When, at the dawn of globalization, the first trader left home to barter his goods or the first explorer left on a journey to discover new people or new places, the world was unknown, nor were there any rules. But as human connections spread, problems arose over how to transact business, whose law to follow, or how to avoid conflict. Over time, laws were promulgated over territories that outsiders were obliged to respect. 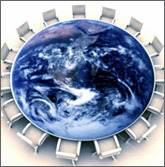 But as global connections led to global problems, the need to develop collective rules of governance became apparent. Of the myriad issues calling for global governance, nothing is perhaps more urgent than a global agreement to deal with the threat of climate change.